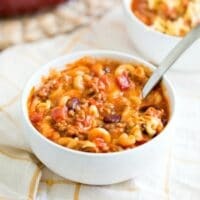 This yummy, cheesy one pot chili mac and cheese is the perfect hearty recipe for dinner! In a large dutch oven, saute diced onions until translucent and they start to caramelize. Add ground meat and brown until just done. It’s okay if it still has some pink in it before you add the rest of the ingredients. Add seasonings (minus the baking soda) and cook for 1-2 minutes, stirring continuously. Pour in the tomato sauce, diced tomatoes, water and tomato paste. Bring to a simmer over medium low heat and cook for about 10 minutes. Stir in the baking soda. The sauce will start to bubble up. Stir over medium heat until the bubbles have gone away. Stir in beans and pasta. Simmer until macaroni is al dente. Remove from heat and sprinkle cheese on top and let it melt. Stir and serve. Top bowls with more cheese.